Acupuncture is a therapeutic treatment that involves the insertion of very fine needles into specific points on your pet’s body. These points have been identified to have beneficial medical effects and aid the body in healing itself. This treatment can have numerous beneficial health effects for many conditions – in conjunction with or in lieu of other rehabilitative and/or medical treatments. Studies in both humans and animals are providing new insights about the mechanisms of acupuncture therapy. Current research suggests that the needle insertion stimulates nerve bundles at the insertion sites. Once activated, these nerves send signals to the brain with a number of effects including changes in pain, blood flow, emotional state, muscle tone, immune response, hormone and neurotransmitter release, and nerve function, all dependent on the selected sites and how they are stimulated. What Happens During a Session of Acupuncture for Dogs and Cats? It is usually helpful for your pet to be as calm as possible prior to treatment. 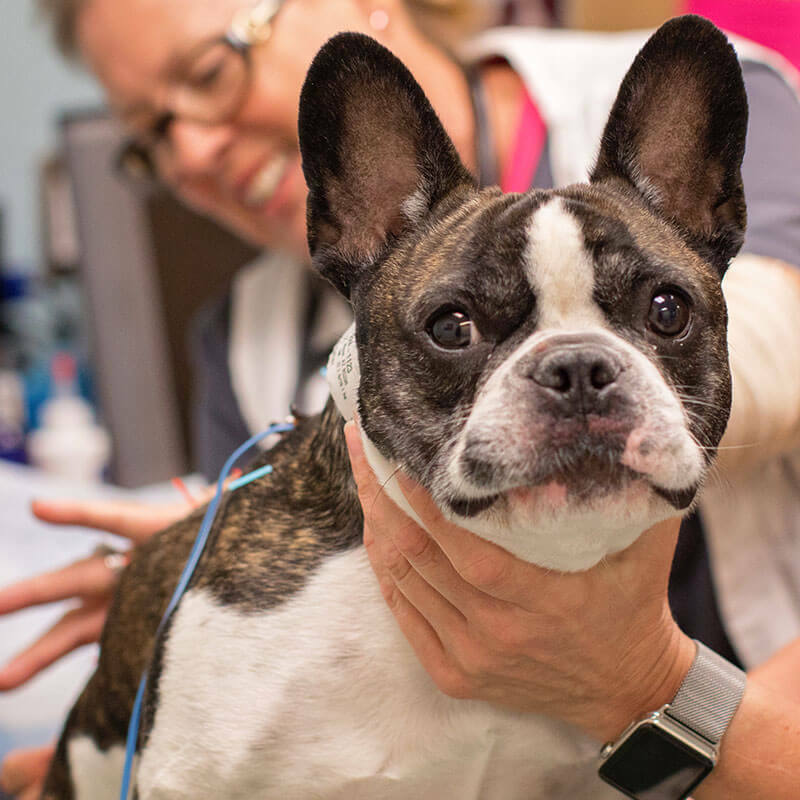 Most pets become increasingly more relaxed or even drowsy during the procedure. The acupuncturist places a number of very thin, sterile needles into specific locations, based on the diagnosis. Most pets will feel little or no pain during the needle insertion, although particularly sensitive areas may cause minor sensations. The number of needles, locations, frequency, and duration of treatment all vary based on your pet’s specific needs and condition. The work of activating the selected sites continues while the needles are in place. Needles are removed at the end of the session (usually after 10 – 30 minutes). Acupuncture has been used in China for thousands of years to treat medical conditions in humans and animals. The use of acupuncture in the United States has been steadily growing since the 1970s. Although developed through and often described based on principles of Traditional Chinese Medicine (TCM), emerging research confirms its benefits from a “Western Medicine” understanding. Although more research has been done on the benefits for humans, several studies show similar efficacy for use in animals. Acupuncture is one of the complementary medicine procedures with the most research and scientific evidence to date. Is Acupuncture Safe for Pets? Acupuncture has a very low incidence of adverse side effects when performed by a properly trained professional. Since sterile needles are used for the procedure, infection at the insertion site is a very rare, possible side effect. Some pets appear more lethargic immediately following treatment as the body uses its energy resources to provide the natural healing effects that have been activated. In such cases the treatment will be adjusted by the acupuncturist during subsequent treatments. As part of our rehabilitation program, we are pleased to have Dr. Jessica Venable DMV, CVA, CCRT leading our North Valley rehabilitation team. Dr. Venable has been practicing medicine including acupuncture since 2009 since she graduated from Colorado State University. Deb Carey, MS, DVM, CVA, CVPP is part of our Mesa team of rehabilitation professionals. Dr. Carey has been practicing veterinary medicine since 1989. She received her acupuncture credentials in 2008 from Colorado State University.